Yes. The beautiful woman polarized here above is none other than Nneka Lucia Egbuna or simply NNEKA. For some reason, the ladies for this blog are a bit harder to reach, so I am very proud to have Nneka featured here. If you are not familiar with NNEKA, let me be so kind to introduce you to this tiny lady with the grand voice. Nneka is a singer-songwriter, born and raised in Warri , a major oil city in the Delta State of Nigeria. To pursue a higher eduction Nneka moved all the way to Hamburg, Germany when she was 19. It took Nneka a few years to adjust to her new way of life, living in a culture that felt so different from her own. In Nigeria music is a part of life , so for Nneka it was always something that was present in her life (singing in her school church choir for example) but she didn’t do anything professional with her talent untill she was in Germany. 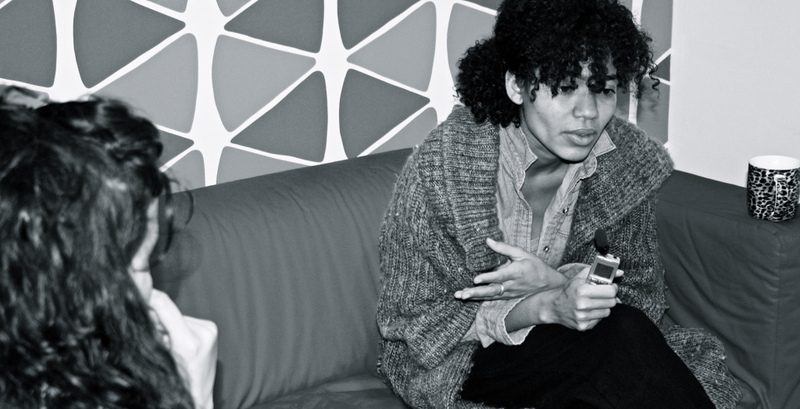 Education is very highly praised in the Nigerian culture, so Nneka enrolled at the Hamburg University to pursue Antropology while she was working on her own sound with long time collaborator DJ FARHOT. With her first album called VICTIM OF TRUTH, it was instantly clear that NNEKA is an artist first and foremost. Instead of chasing fame and glamour with a ‘one hit wonder’ Nneka debuted powerfully with a conscious album touching topics like war, corruption, politics and social issues concerning to her and her country ‘Naija’. This track called KANGPE from her first album might ring a bell. With AFRICANS she reached out to Africa to stop blaming for its past and look forward. However, the first time I ever heard Nneka was with this powerful song called HEARTBEAT from her second album called ‘NO LONGER AT EASE’. Definitely take a look at her live performance of the song in David Letterman’s Late Night. It immediately grabbed me by the throat. It’s a simple song, but the power and emotions that come out of it slap you in the face the very first time you hear it. You feel that the song is genuine from the heart, carrying a very clear message executed with passion. The song WALKING is another standout track from her second album. After touring the United States extensively and playing with artists like The Roots and Nas & Damian Marley, Nneka is now back in Europe to promote her third album called SOUL IS HEAVY. Here are a few of my personal favorites from the album: the revolutionary VAGABOND IN POWER, the breathtaking STAY and the strong SOUL IS HEAVY. Now, you all wondering how I got the Polaroid right? Well, I’m actually happy to say for once that I got a little push in the back. Mostly my stories are accompanied by a various events of calling, mailing and stalking people to get somewhat of a chance to succeed in taking the Polaroid. Mostly I go to a venue, and half the time it is one big question if I will succeed or not in my goal. Which often make the best stories, I agree. But it doesn’t come that often that a label asks me if I would be interested in taking a Polaroid from one of their artists and tell me that ìf I want to do an interview, the possibility is there as well. So armed with my little camera and a few questions I headed to Brussels for a little one to one with NNEKA. No, I am sorry that I am so honest. ‘Soul Is Heavy’ because…It’s more or less a similar message like I had with my last record ‘No Longer At Ease’ just in a different way, a different sound, a different rhythm. In this case, there is a lot going on in my mind, a lot that has happened around me that I have taken in. And I feel there is a necessity for me to be able to let it out, it has to be. That emptying of the heart, more or less. ‘Soul’ doesn’t necessary mean the soul alone, but also the mind, the emotions, the heart. And since the soul is part of the spirit, a part of the spirit is also sick. And ‘Heavy’, in the sense that there is a lot of weight and there is a lot of darkness around what I feel or think about the world at present. And on the other hand…it’s darkness understood. It’s not necessarily anything negative. For me, to be able to give the sort of energy that I give out to the world through my album or by being on stage I have to be in feel with that dark energy. ...and the expression on your face is rather worried, what is the story about the artwork? That is exactly how I felt at that point in time. There was no other, better way to express the feeling off everything has already been said before. It’s just repetition. Agàin. In different songs and melody. The feeling of emptiness, the feeling of so much that still has to be said. There is a lot of emptiness within. On that album, I have no identity. I have no face. I have no colour. You don’t know where I come from. You don’t know if I’m white, black, green, Eskimo, or whatever. It’s just a dry, empty face. With every album comes growth. What did this album do for you in terms of growing, and what is the difference with ‘Victim of Truth’ and ‘No Longer At Ease’ ? Growing….I don’t think I’m growing. Evolving…maybe. Evolving is also picking up and giving away. Good or bad. I’ve picked up some negative things. Definitely…. (laughs) I need to work on that. And then I picked up some things as advantage aswell. That’s part of learning, that’s part of life. If you wan’t me to go into the whole superficial talk, sure…“Musically I have travelled around and that is wonderful and inspiring…and… ” (stops and looks at me, with a sceptic look) You know what I mean. I am definitely more concerned about creating music the way I feel it should be created. Sometimes I tend nòt to work with producers, I want to do it àll by myself. Which I tried to do on this record. You worked on more material by yourself? Ow yeah. I did like 6 or 7 songs all by myself. Solitary confinement is good, but you definitely need the world. There are so many things you can’t do and you have to understand that you are not the master of everything. If you try to be the master of everything, you fail. Which songs from ‘Soul Is Heavy’ are the most precious to you? I like the track ‘Soul Is Heavy’. I think it is the strongest track on the record. It’s one of the tracks I feel very, very committed to, especially because of the message. It’s everything. It tells you the past the present and….the hopeful future of the world, of Nigeria aswell. I mention a couple of names that had a lot to do with how Nigeria has become. I mention the war. The Biafra war. There are so many of these things that have happened that are pushed aside. Not forgotten, but just pushed aside, under the carpet. Nobody wants to confront these issues, but these issues have to be confronted for us to be able to make a change nòw. The root has to heal, for us to grow. I think that song is a beautiful symbol of the past, the present and a bright, hopeful future of Africa and the world in general. Heartbeat is one of your biggest songs to date. It conquered the world. What does the song represent to you looking back. Heartbeat, is…yeah. It has taken me over borders, it gave me recognition in my hometown, gave me recognition in the United States. It encouraged me that simple music (smiles) that is created within 30 minutes could go all over the place and you know… hit people’s minds and inspire people. What I also like is the fact that ‘Heartbeat’ is a very, very strong song and conscious when it comes to the lyrics. And I’m actually glad that thàt sort of track was able to access people’s mind. Because, nowadays, what people like are more simple melodies and mainstream, not necessarily anything conscious or with any message. Marvin Gaye once said: ‘Artists suffer for the people’. What do you think about that quote? … why is that statement true for you? It’s a fact that you are vulnerable every day. You are open, naked, everyday. You are showing emotions. And regardless of that, you have to smile. You have to able to entertain, to fulfill the needs of many. I try not to allow the expectations of the world get into my head but sometimes you have to respect what has made you the artist that you have become. Which is the acknowledgement and recognition of the people. That is what actually makes me suffer the most. But on the other hand, my kind of suffering is more like…If I don’t suffer I won’t be able to create music. I’m a freaking suffering soul man. I’m freaking damaged man. That’s what’s up. A troubled, battered mind. But I’m cool. (laughs) I’ve accepted it. I have found my balance. To balance myself, I have to make music and that is what fulfills me in the end. Everybody who knows your music, knows that you don’t avoid political and social topics. You have a degree in anthropology. Will music make place for the degree one day? Maybe. I don’t know. I strive to engage myself as much as possible with what I have studied when it comes to Nigeria. I studied archeology and anthropology so I’m concerned about how we preserve our artefacts. I’m trying to see if I can go in museum preservation. It’s something I do parallel to the music. If it is not music, it will be something else. I’m into painting aswell. Hip Hop is never really far away in your music. It’s always around the corner sort of speak. You previously collaborated with Nas and on ‘Soul Is Heavy’ you have worked with ‘Black Thought’ from The Roots and the British Miss Dynamite. There is also the J Period mixtape. Can we expect more of this in the future? I might do a mixtape. Mixtapes are always cool. What about a concept album like the Distant Relatives album? Ow that kind of stuff? I have never thought about it like that. I don’t know. I have to be more open. I don’t like working with people. That’s a big problem for me. I don’t know hòw to work with people. I must really,really, réally be into you and spend time with you. (thinks) I think I should be more open towards that. I would like to do that eventually, I see how other artists do it, they sit down together and they do it, but it’s very difficult for me, because I am very shy about my work. My work is like a painting, I don’t allow you to look at the painting before it is finished. I’m very secretive. I have a secretive way of creating music. But…I’m trying, I’m trying. I don’t know who I would like to work with. I liked how I worked with Miss Dynamite. That was very cool, because the energy was very similar. The same with Black Thought. How did the collaborations happen? With The Roots, it started with me playing with them. And also through J Period we became friends and it evolved from there. With Miss Dynamite it was together and with Black Thought I send him the track. You are inspired by artists like Bob Marley, Fela Kuti, Lauryn Hill. What are you listening to right now? Final question if I say Belgium, what 3 words pop in your mind? 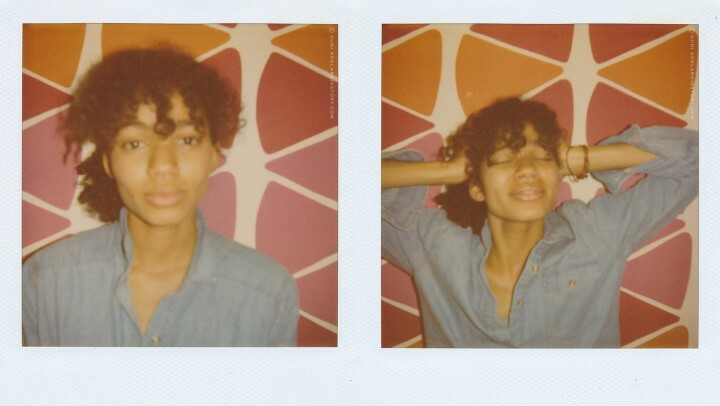 After the interview it was time to take a Polaroid picture of Nneka. She loved the colourful wall of her backstage lounge and suggested we should use it for the Polaroid. She is compared to the same artists she admires like Erykah Badu, Nina Simone, Lauryn Hill, and even Fela Kuti because of her fearless lyrical approach wherein she confronts the mismanagement of her country. But although she is inspired by them all, she is first and foremost Nneka. Nneka is not singing to chase billion dollar dreams, pursue careers in fashion or to be a mega superstar. ps: special thanks to Sony for the opportunity and Candeesha for assisting me with this story. I like that she is very very very honest.